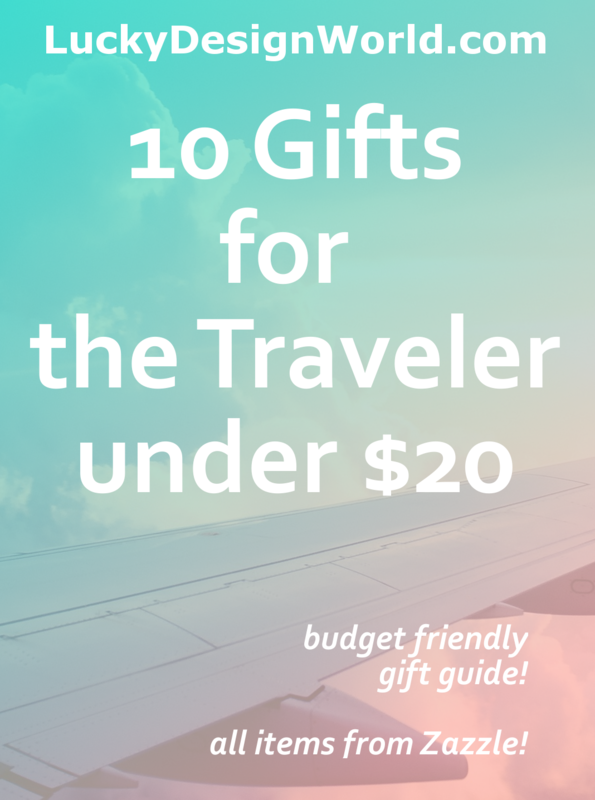 Here is a short list of 10 wonderful, trendy and unique travel themed designs and products to gift the traveler in your life! If you know anyone who travels a lot or, perhaps you know someone who’s going to study abroad for the first time, a passport holder would be a fabulous gift! There are plenty of designs that are out there, but what makes this one so unique? First, the price! It’s affordable with a list price, as of this writing, at $19.95 USD. Second, the faux gold provides a grandeur and luxe look without having to pay a fortune! This design makes a great gift because the design is contemporary and the black and gold mix is beautiful. The Earth in the passport is represented in gold and it really is a treasure and to have the experience of traveling is really worth more than gold. There is a little image of a plane that is always on the go! There is a monogram option in a sleek modern typography font. This is for the stylish traveler in your life! The store, MixedWorld who is a ZPro Bronze Designer, has a variety of products and more travel themed items and a lot of Earth Map designs a well, such as this collection of world atlas maps. There are over 77, 000+ travel postcards in the Zazzle Marketplace. This is the most popular one! It’s only one dollar. 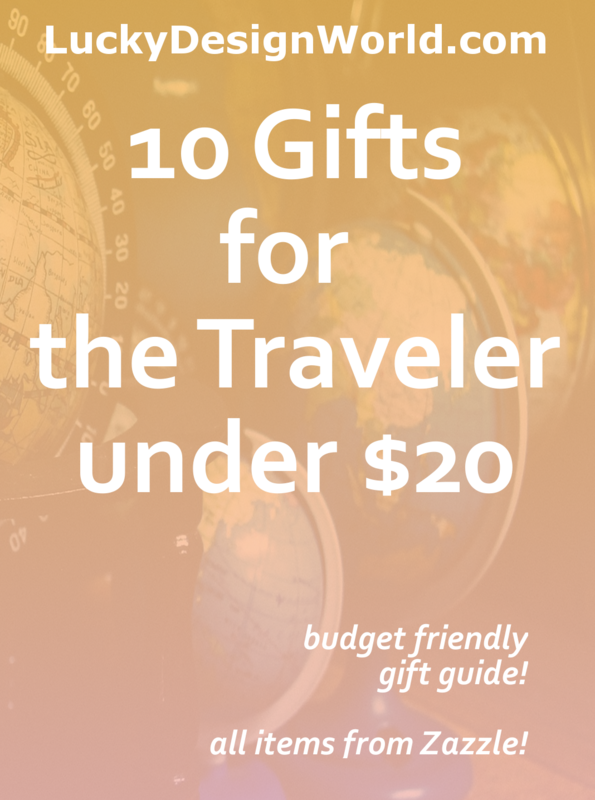 A budget friendly gift idea would be to get a few that features the location or locations that you know your traveler loves! You wouldn’t have to send it, your traveler could even use the postcard as a make-shift bookmark for those travel guide books! This design is like a travel themed promotional poster for the Sunshine State. It features bright sunny colors, the beach, palm trees and a crowded restaurant. It would make a great gift for someone you know who’s a snowbird and travels to warm places during the colder seasons. It would be great for anyone who is a travel enthusiast to Florida, like Orlando, Miami, Key West and, of course, more warm Floridian cities! Star_Raving_Realist is a ZPro Silver Designer and offers a wide range of products including the collection of popular “Space Cats”! Contact the designer if you’d like something customized. A tote bag makes a great gift for the traveler because if you think of it this way: it’s roomy, light-weight and stylish! It’s perfectly easy to add one more item to your travler’s suitcase. It’d be great to bring for a weekend trip such as a brief afternoon at the beach or take it along to a local farmer’s market . This design has a list price of $9.95 USD. That is affordable! This design is a modern typography design of a quote: “Let’s go on an adventure!” The font is sleek and underneath the typography design is an picture of a valley that looks to be the West. Do you know anyone who loves to visit the American West or anyone who likes to visit natural places like parks or canyons? This would be an ideal gift! Brouhaha_Bazaar is a store that features cute and weird designs that totally work! You have to see it , I’d recommend this fun dinosaur design and the wanderlust collection for more ideas ! Another fun gift idea would be for the Holidays at the end of the year. If they’re home for the holidays or away, this ornament is small enough to mail or take with them to their next destination or keep as a reminder of your thoughtfulness. This design features an excellent and popular quote: “The World is a book and those who do not travel read only one page.” It’s a quote attributed to Saint Augustine and these words of wisdom still applies today! One more great thing about this particular ornament is it’s price! It’s list price is $17.65 USD, so it’s below budget! Second, the design’s presentation is a nice well-worn vintage look with a Ferris wheel, Eiffel Tower with floral and fauna elements. It’s a beautiful look all together what has a timeless feel to it. MarigoldWinterstamp is a ZPro Bronze Designer, has many whimsical designs that have a unique approach in updating vintage elements to modern tastes. There is a wanderlust themed collection here that features many amazing quotes. Decorate boring luggage with a bright tag! This one is orange! Did you know some of the attributes to the color orange? It’s warm, has a joyful meaning, it’s cheery and symbolizes creativity and success. That would be great to add to this design. It also uses a popular quote: “keep calm and carry on” which historically was used by the British during World War II to boost morale. Here’s it revamped to include an airplane silhoutee and the words: “Keep calm and travel often”. It’s a motivator for your traveler to keep on going and follow their dreams! This design has a nice list price of $10.50 per tag. Blueberrylane has many more items related to traveling, such as this French : Je t’aime tag. This next gift idea suggestion is a notebook! It’s another lightweight item for a backpack or suitcase. Or it could be a notebook to jot down their travel memoir! So many great ideas – another one would be a traveler that wants to take an analog moment and write down their next itinerary or brainstorm their next world adventure! Even to write down recommendations of restaurants or landmarks to visit, a notebook makes an excellent gift! This design is from my store on Zazzle and it features a Hawaiian theme that could be a great souvenir gift or a gift for an upcoming adventure to the islands. It has a “aloha” saying to inspire a calmness and feeling of gratitude. The pineapple is a cute cartoon with a little heart and warm smile. A pineapple is a lucky symbol of hospitality and prosperity. The current list price is $13.20 USD. Another nice feature is that this notebook design is customizable so you could add a name or a quote or your traveler’s favorite Hawaiian locale! Lucky Design World is a new store that features designs of French Quotes, Aloha Lifestyle and Good Luck Symbols. One popular collection is Love Conquers All which is an inspirational message but also great for anyone you know who may be traveling to France or other francophone destinations! This next design is featured on a Luggage Handle! Make sure the traveler in your life has this because it helps avoid mix-ups at the baggage claim’s carousel since it’s so easy to spot! The design is a classic passport stamp look with a personalize feature to add your traveler’s name! The list price is $10.75, very affordable! JunkyDotCom is a ZPro Silver designer featuring illustrations, hand-lettering and typography. Another cool travel themed collection from this trendy store is Travel Posters! A travel themed tee would be another great gift choice because whether your traveler is out and about or at home, your friend can look stylish representing their passion – travel! Here’s a cute cartoon design with a unique twist! It’s a trailer! Know anyone who likes to go camping? Anyone who likes to drive country roads or highways? There are so many famous routes to take in the U.S. Perhaps you know someone who would enjoy this tshirt? The current list price is $17.95, a very affordable price for a one of a kind design! PittStar is a store that specializes in vintage travel trailer camper designs and RV related designs as well. There is a cute camper Christmas Holiday Card too! This next item is a bumper sticker with the quote: “Take the road less traveled”! Do you know anyone who RVs? or like to go camping? Or someone who like to drive country roads to get to farmer’s markets and mom&pop flea markets in small towns? This would be a great gift to give them! This sticker has an affordable list price of $4.45. It’s truly unique! Road Less Traveled is a store a lot of travel and outdoorsy products. It features tons of nature scenes to inspire outdoor camping, hiking and more! One nice postcard is of the view of the Sawtooth Mountains from Galena Summit in Stanley Idaho. The last but not least travel themed gifts is a magnet! This little gift would be great for your traveler because the magnet can hold up their souvenir photos from their most recent travel destination! A reminder of past fun they had and to also inspire them to plan out their next itinerary! This design has a list price of $8.05 and has a minimalist design that is so cute and contemporary. It could be a great souvenir for Rome! Soul Journey On is a travel themed store on Zazzle! It’s tag line is “traveling to where your soul wants to go!” There are many categories to chose from like keychains and posters. One example from the poster category is their Tropical Paradise Sunset with ocean and dolphin! This concludes the first gift guide list for the blog, it’s over 1800+words and once again: It’s been really fun! …Have thought about blogging yourself? If yes, then I’d have to recommend using Siteground because they provide safety along with speed. With brilliant and excellent customer service – they know their stuff and are going to help you along the way! Not to mention, great bargain prices ! Try Siteground today! Next PostNext Customer Appreciation Event!